This guide tells you what principles to follow when you design how your bot looks, talks, and interacts with users. Why build a bot for Hangouts Chat? 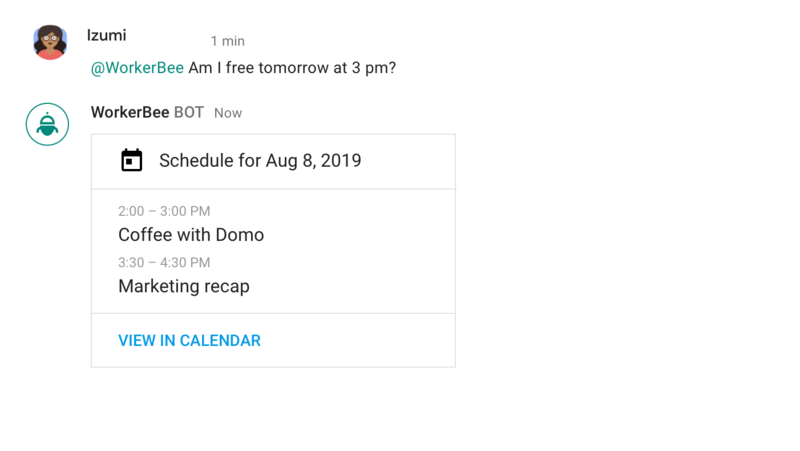 Bots provide a lightweight, conversational way to connect services to users in Hangouts Chat. Great bots deliver quality services while leveraging the advantages of the medium. To summon a bot in a room, a user @mentions the bot (for example, by typing "@WorkerBee") and then selects the bot from an autocomplete menu. If you enable the capability for your bot, users can send a direct message to the bot once they've installed it from the "Message a bot" screen. Bots can interact with users with either plain text or formatted cards. The following paragraphs present some guidelines on when to use each. Text is the primary medium for a bot's communication. Well-written text can guide users in a straightforward way, and allow them to respond naturally. You can enable your bot in rooms, in direct messages, or both. We recommend you enable your bot in both, even if you want to limit the experience to one or the other. If your bot receives a direct message, have it respond with a simple reply that directs the user to the right place. This helps with discoverability for your bot, makes it appear intelligent, and provides another opportunity for user education. This section provides guidance on how to compose text from your bot. Be brief. Break up large chunks of text into multiple messages. Avoid saying everything in favor of saying the important things. Each message has one purpose. The value of bots is the ability to interact quickly. Be resourceful with your bot's messages. Try to limit them to one call to action, and make the information presented as relevant as possible. Be transparent. Don't overpromise. Make sure the user knows what your bot can do and what it can't do. **Avoid personification. **Your bot should focus on its utility, not its character. Voice refers to the way your bot reflects the service that it represents. Each bot is different, and the choice is ultimately yours. Professional. Your bot will be helping people at work. Make sure its personality fits into a professional setting, or it may feel jarring and inappropriate. Authentic. Bots can speak colloquially, but should not pretend to be human. Avoid giving your bot a gender, or a name that could be confused with a real person. Humble. There are few opportunities to convey your bot's user benefits. Don't waste them on vague claims. Undersell and overdeliver. Considerate. Be thoughtful and noninvasive. Your bot shouldn't bother users unnecessarily. It should strive to anticipate user needs and offer solutions. Efficient. Recognize that most users aren't looking for chitchat. Help people complete tasks by keeping the bot experience focused. While your bot's voice should be crisply defined, tone can vary depending on the context. Here are some tonal notes we think are particularly important to hit when writing for bots. Encouraging. Bots are new to most people. Be optimistic and friendly with the user as they explore. Attentive. Your bot should make the user feel as if they're important and cared for. Optimistic. Bots will fail the user at times. Remain optimistic in these moments to keep the user engaged and hopeful about future interactions. When naming your bot — Avoid using the term "bot" in your bot's name, since Hangouts Chat appends "bot" to its name automatically. Make sure your bot's name reflects what it actually does, or the known service it's integrated with. The name should tell the user what the bot does. Conversing with a bot can be confusing. Here are a few principles to help ensure users have a smooth and engaging interaction. It's good to let the user know when actions have been completed. Quick confirmations like "Done!" or "OK, you're all set!" are better than silence. Keep confirmations short. This not a good place to inject new information, or tell the user about other things they can do. The user should never be unclear about whether the bot "heard" them. Work hard to reduce latency; if latency is unavoidable, make sure you touch base with the user in the interim. Be mindful of how much your bot is posting. If your bot can be configured to send a lot of updates or notifications, make sure users are clear on how to dial down the noise by including that in your "Help" message. If your bot makes changes to a user's data, make sure they can quickly undo the changes. Avoid obvious spelling and grammar mistakes. Look out for typos, and have someone with strong English skills review your bot's messages before submitting. When in doubt about grammatical style, consult the Google Material writing guidelines. Make sure your bot can communicate with the user if they're lost or stuck. Error messages are crucial to a high-quality bot experience. Consider making a generic help message that users can trigger at any point if they don't know what to say. A user's experience with your bot has a life cycle, starting when the bot is invoked and ending when the user action is complete. Your bot should navigate the user through the stages of that cycle with good messaging. Setting expectations about what your bot does is crucial. You must craft a welcome message that triggers automatically when the user adds your bot to a room or messages it directly. If there are multiple steps in the user's journey, you may want to offer textual indicators to help ground them. Transitional phrases like, "Next, what size do you want?" help keep focus and orientation. You may want to announce when the user is near the end of a long journey. Phrases like, "Last step..." or "One more thing" can help reduce user fatigue. If the journey has stalled for any other reason, and the action has not been completed, help guide the user back towards the beginning. There are a few important commands that we either require or strongly suggest your bot support. 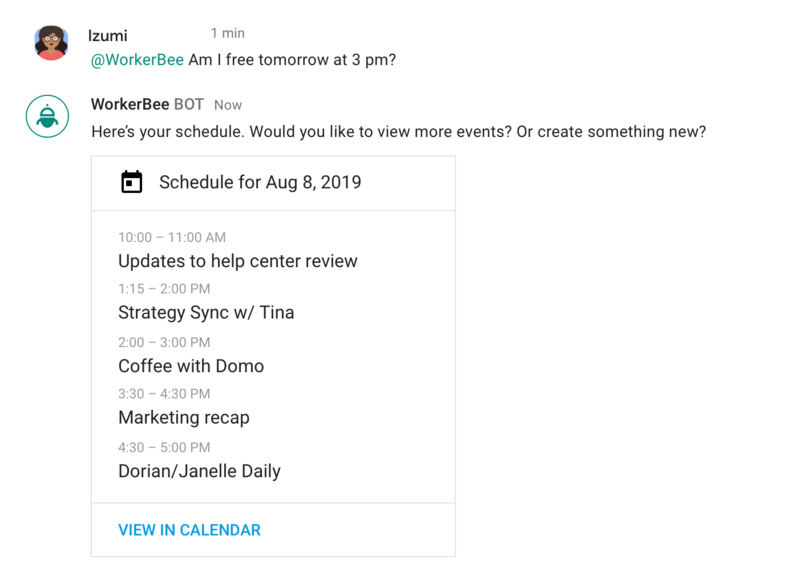 These commands will become familiar to Hangouts Chat users who have used other bots in the ecosystem, and so they'll come to expect every bot can handle them. A good place to communicate that your bot handles these commands is in your welcome message. This command is required for all bots. A user should come to expect that typing "@bot Help" in an interaction with any bot will return some information about how they can proceed. If your bot requires any type of user configuration, you should allow the user to reconfigure that quickly at any time. All bots can be improved over time, and users can help you make good product choices. Users will get used to easily registering feedback with bots in Chat. If your bot requires authentication or configuration, you can opt to show a user a private card in a room. This provides a better user experience, allowing users to set up the bot in a room without disturbing the rest of the room members. Your bot should handle unexpected events gracefully and appropriately. Otherwise, trust in the bot will erode. The more nuanced with your error handling you are, the better. At the very least, you need a generic error to account for unanticipated messages from the user. In most cases, your bot won't know what it doesn't know. You'll need a generic error to account for every user request that your bot isn't programmed to deal with. This can be as simple as a reiteration of the help message, with an acknowledgment of the fact that your bot didn't understand.